When I was coming up with the concept for cover photo, I knew I wanted someone who was an "everyday" woman. To me, this meant that she wasn't a fitness model for a living or even a personal trainer. I wanted someone who has just intertwined fitness into their lifestyle and also doesn't let anything get in the way of that, including health conditions. This passion to live our best lives no matter what is what I wanted to capture in a cover girl and feature. This month's cover girl, Kinya Harte, is a pretty dope woman. She's a big city, urbanista and career woman doing her thing. 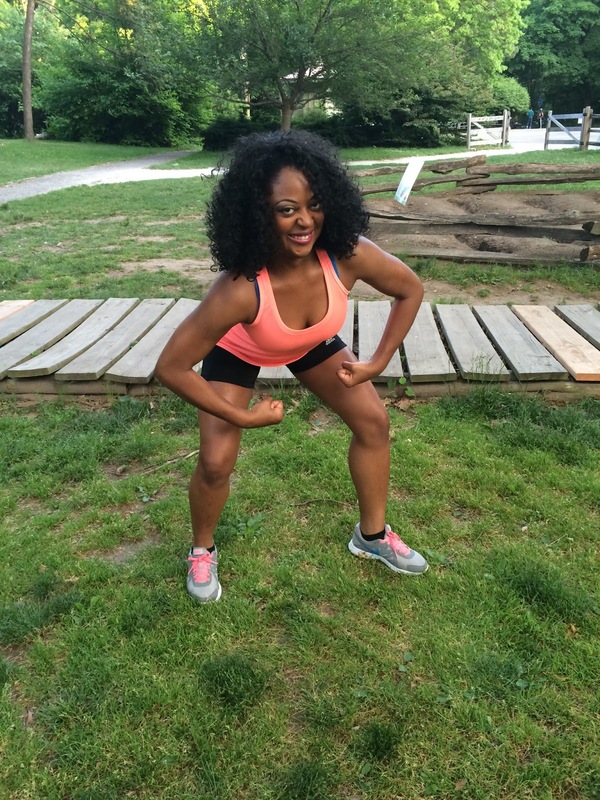 We talked to Kinya to learn about her and her health and fitness journey, which includes having thyroid disease. Gone with the wind fabulous. 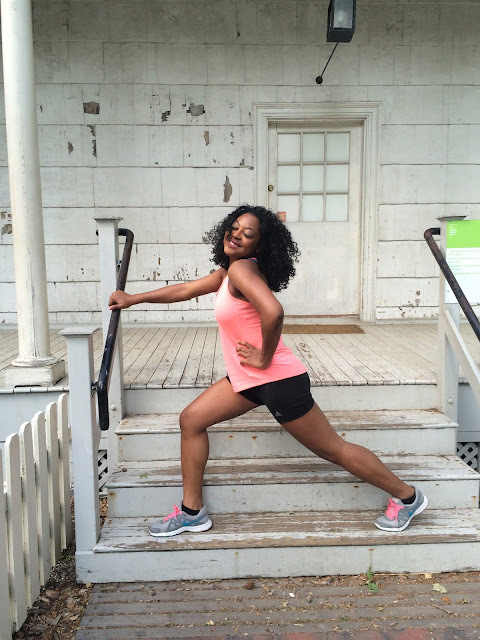 Lunges on the stairs, anyone? KH: I'm a 31-year-old marketing and communications professional living in New York City. I live a balance life between the digital and analog age and understand and appreciate the value in both ways of life. 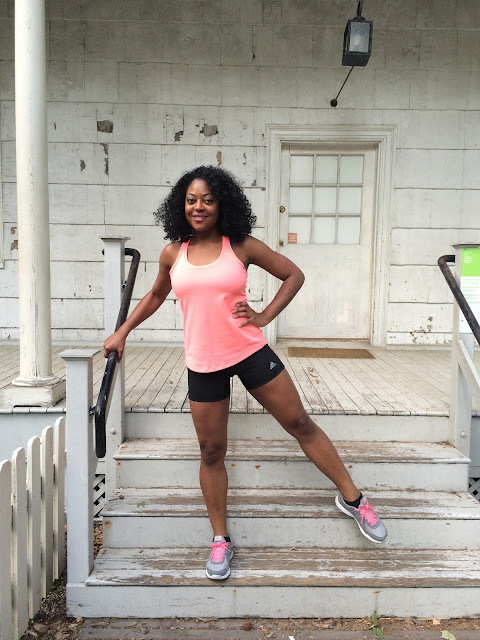 AGCM: Was fitness always a part of your lifestyle? If not, when did you incorporate it into your lifestyle? KH: I've always been active; but I wouldn't say that I fully understood or was aware of living fit until college. As a kid, I would always be outside playing games with other children, riding my bike, climbing trees and of the sort--that was just the way of life for 80's babies. Video games were usually relegated to rainy days. By middle school and high school I was active by way of sports and I always looked forward to gym class. However, by the time I went to college that changed. I was consumed by school work and socializing that exercising regularly--and even eating well--just wasn't something I did. After college I started exercising and changing my eating habits. I was never overweight or out of shape, but I definitely started feeling better once I became more active after college. 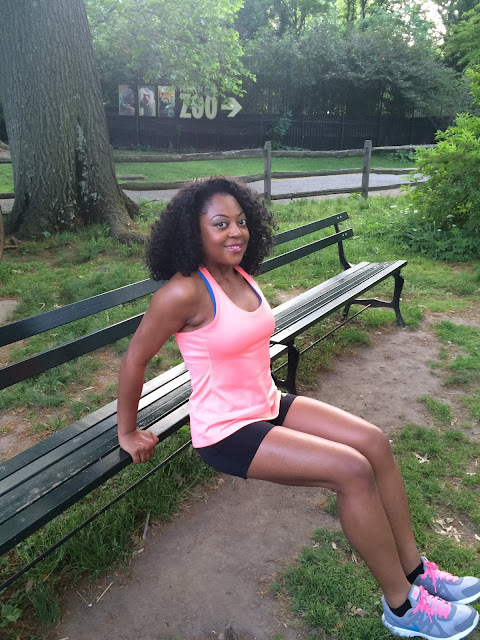 My thyroid disease has also played a part in becoming more fit. Dips on a park bench for a good tricep workout. AGCM: What are your favorite exercises, classes/programs, etc and why? KH: I really enjoy fitness classes over working out alone. My favorites are HIIT (high intensity interval training) classes like boot camp and Insanity. It motivates me to workout with other people. Also, the instructor sets the pace and I have to keep up with it. Sometimes when I workout alone, I feel as though I'm not pushing myself enough. AGCM: Please talk about your condition with your thyroid and your journey to address/heal it. How has it affected you? How has it affected your health and ability to workout/exercise? KH: I have a very long history with thyroid disease starting back when I was a child; however, I feel it hasn't really affected me until my late 20's/early 30's. I'm hypothyroid as a result of taking Radioactive Iodine to treat hyperthyroidism. Hypothyroidism is an autoimmune disease that affects thyroid--which produces hormones that control just about everything in your body from your metabolism to your emotions. Being hypothyroid it is very hard for me to lose weight, difficult to maintain weight and easy to gain. This condition has really steered me into living a cleaner, healthier life that included cutting the amount of refined sugar and dairy in my diet and increasing physical activity. "We want to pump YOU up!" AGCM: Because we are more than just hot bodies and muscles, what are some of your favorite pastimes?KH: I love reading! Reading is truly a great escape and has always been a great past-time of mine. I also enjoy tapping into my creative side, whether it is through art, decorating or designing websites--it's a great outlet. Thank you, Kinya, for being this month's cover girl and giving a peek into your healthy and fitness life. To learn more about Kinya, visit KinyaHarte.com and follow her fun Instagram page @next_of_Kinya and to learn more about her thyroid condition and journey to healing, subscribe to her Youtube channel to watch her videos. Sorry For Delay- The June Cover is Coming!